What is a coupon QR code? It is a QR code (coupon) that allows one to get a better exchange rate. By placing the QR code on Smart Exchange, you allow the machine to read it. Is the exchange rate at the local banks better than that of your machines? The rate of our machines is better in most cases because no administrative fee is charged. What currencies can I use to exchange for Japanese Yen? 12 currencies are acceptable for our machines. Is the exchange service available for 24 hours a day? The business hours are different for each machine. Please check here. Are there any identification documents such as passports or ID cards required for using the exchange service? No. Please feel free to use the service. Why did the machine refuse to accept my foreign currency notes? Please make sure it is one of our acceptable currencies. There is also a possibility that banknotes with dirt or wrinkles might be refused. Please try again with another banknote. The phrase “Service is unavailable right now” is shown on the screen. Unfortunately, the machine is under maintenance and cannot be used. Please wait until the maintenance is completed. You can also use our other exchange machines nearby or go to the currency exchange stores. Foreign currency notes were inserted but no Japanese yen came out. 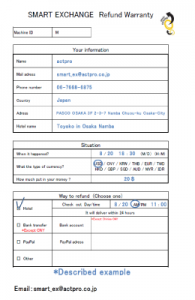 Please fill in the Refund Request Form which is put on the top of the machine and send it by e-mail. 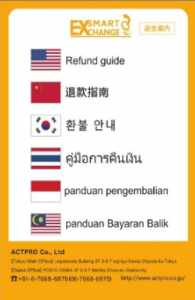 We will proceed refund according to your preferred refund method ASAP. Is there any customer service hotline for urgent enquiries? Yes, please contact our call center for assistance.